Carolyn Lee Allison Rhea joined her husband, Lynn, in Heaven, with their Lord on January 20, 2019. She was born to Ruby V. and Edgar Lee Allison on December 2, 1931. She and Lynn had been married 63 years when he passed away on August 17, 2013. She also lost her daughter, Linda, on March 1, 2016. 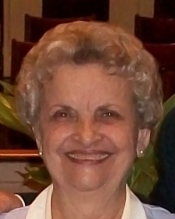 She was a longtime member of Red Bank Baptist Church. She is succeeded by her son, Mitchell Allison Rhea and “other” son, Russell Norris; four grandchildren: Carol Pyke (and husband Chris), Daniel Roberts (and wife Nikki), Stephen Roberts (and wife Misty), and David Roberts (and wife Samantha); seven great-grandchildren: Mark Gentry (and wife Pam), Michael Forbis, Lacy Roberts, Gage Roberts, Sawyer Roberts, Kelton Roberts, and Kayla Roberts; and two great-great-grandchildren: Kaylee and Bailey Gentry. The family will receive friends at Lane Funeral Home 5:00 pm until 8:00 pm Wednesday January 23, 2019. Funeral Services will be held at 11:00 am Thursday January 24, 2019 at Red Bank Baptist Church with Bill Harvey and Dr. Fred Steelman officiating. Burial will follow at Chattanooga National Cemetery. The family would like to thank all of staff at Summit View Senior Community for all of their care and compassion given to Carolyn in her last months. In lieu of flowers, the family request donations to a favorite charity.